Question: Our house is wired with a GFI outlet on the outside wall with the deck outlets and the crawl space lights wired thru it. 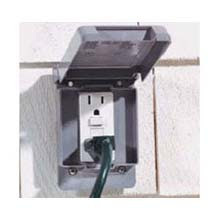 It is on a 15a breaker that controls a few other outlets, which still work when the GFI is tripped. When it rains, the GFI outlet trips and won't reset until it's been dry for a few days. I've replaced all the outlets and weather covers and replaced the GFI outlet, but it continues to trip. Yesterday, a friend came over with a tester and it was dry enough that the GFI would reset. All the outlets checked OK and all the lights under the house came on. Last night it rained and this morning the GFI was tripped again and won't reset. Can you come up with any possibilities for fixing this problem? You have to just keep looking. The GFCI is doing it's job. Water is getting where it should not be. You could try to chalk the boxes shut. Pay special attention to where the wires enter.